Agricultural science students at WIT studying Precision Agriculture in class got a real experience of how it is used in Dairymaster’s equipment on a recent trip. 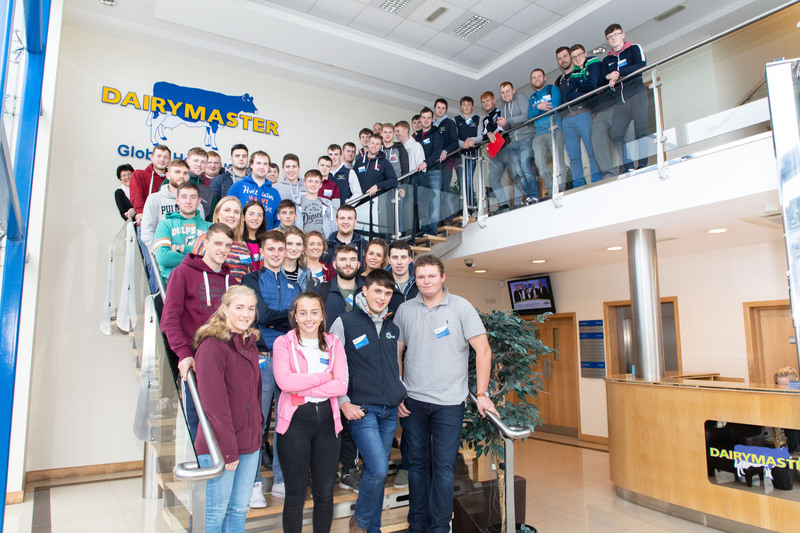 On 16 October 2018, fourth year students on the BSc in Agricultural Science made a trip to Dairymaster, in The Causeway, Tralee with their lecturers Anne Dunphy and Tony Woodcock. This was the second visit by a group of WIT students to Dairymaster and it is hoped that it will be an annual event. Dairymaster is a major supplier of dairy and animal welfare products worldwide. Products range from standard milking machines to large rotary milking platforms. They also produce bulk tanks for storing milk and cow monitors for analysis the cow’s health. The purpose of the visit was to see how Dairymaster uses technology to improve their products as well as how they use technology to manufacture the products. “On arrival in Dairymaster we were greeted by their marketing team led by Mary Mulvhill. After tea we were given some very interesting presentations about the company history, their vision, their products and services,” explains Dunphy. Within the presentations students heard various different testimonials from different customers from around the world. Next they saw how the different robotic systems create the parts required including how programmed lasers were used to cut the required part shapes for the different Dairymaster equipment. Both staff and students found the trip very interesting.